Ah, summer. The word conjures up images of watermelon, slip-n-slides, swimming pools, gardens, and camping trips. Mostly. Unless you’re someone like me who just really doesn’t care much for summer. Give me winter, please! If you’ve been reading here for a while, you might have noticed that I really am not into heat and bugs, so as much as I enjoy garden veggies, I don’t enjoy gardening. I wrote more about that in I Think There Might Be Something Wrong With Me. That’s why I love Farmer’s Markets and gardening friends who share their bounty. It’s a win-win. I get to eat fresh stuff and they (not I) get to garden. You’d think summer would be the perfect time to get in some walking/running/treadmilling/ellipticalling–anything! Uh, yeah. It’s like 125 degrees outside right now. And it’s been that way for a month. And before that it rained for a month and a half straight. And I am a fair weather exerciser. And…well, I have no excuse for those things that can be done inside. We have a really nice elliptical that I could (should) be working out on. This one baffles me. I used to spend so much of my summers reading to my heart’s content. I don’t know why it’s not been the case this year. I ordered books and curriculum early in May for what I knew we would be using this school year, but beyond that, I haven’t put much mental energy into school. Well, until just this past week when I figured I should probably make sure we have everything we need! Which we did, mostly. That was a good thing because Emily decided she wanted to start on Monday. As I’ve gotten older, traveling just takes on less and less appeal for me. So what did I do with my summer? 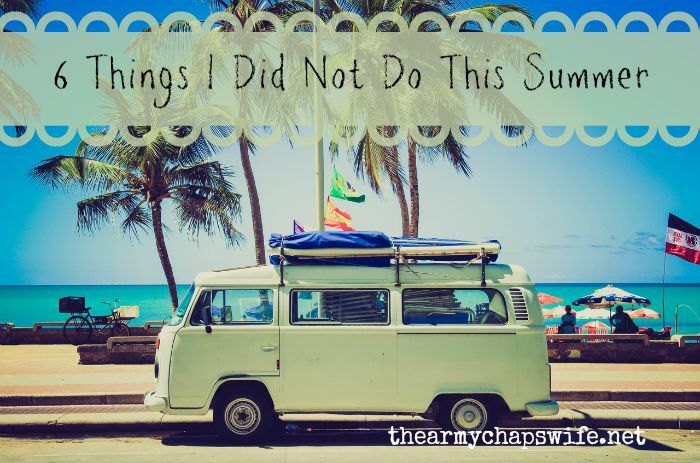 So what have you done–or not done–this summer? I enjoyed your post. I could write one like that too, I think. It was the best kind of summer for me–lots of relaxing, not a lot of stress, and no travel since June–not counting the overnight away in July to get a passport renewed. And I’m definitely NOT an ambivert–introverts all the way (or at least most).